The mission of the Companion Animal Parasite Council (CAPC) is to foster animal and human health, while preserving the human—animal bond, through recommendations for the diagnosis, treatment, prevention, and control of parasitic infections. For more information, including detailed parasite control recommendations, please visit capcvet.org. With approximately 1 million species, arthropods compose the largest of all animal phyla. 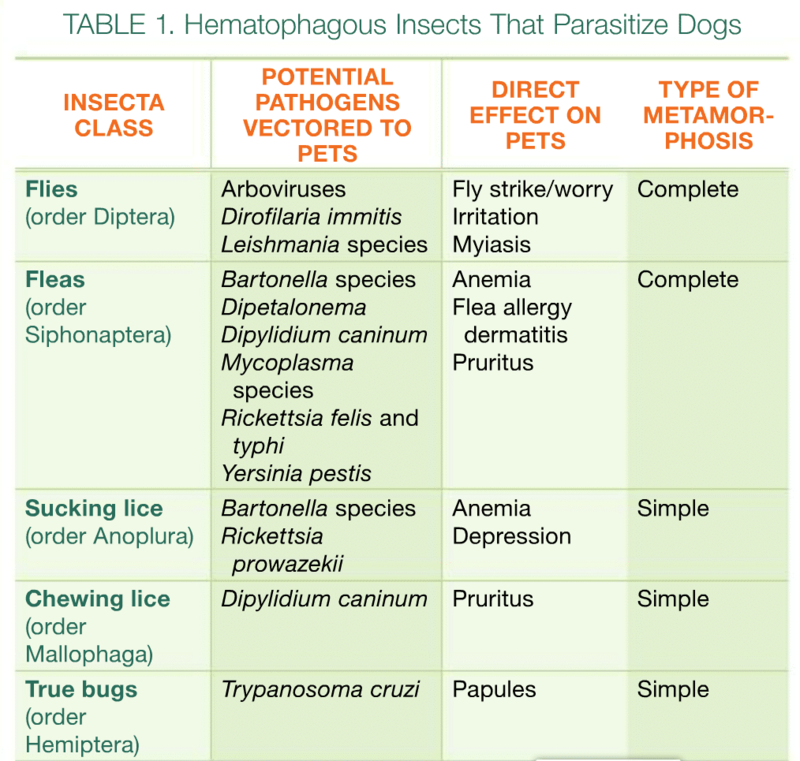 There are at least 6 arthropod classes of medical importance; this article discusses those in the Insecta class that affect dogs in the United States (Table 1). Characteristics that distinguish arthropods from other invertebrates include a hard exoskeleton and pairs of jointed appendages. 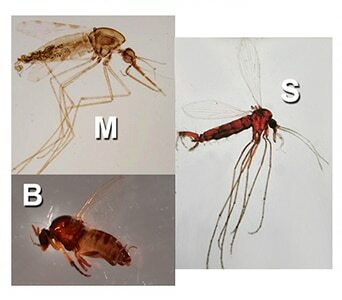 Different arthropod taxa undergo different degrees of metamorphosis as they develop from immature to adult stages, which can be key to effective control of arthropod ectoparasites. * In some parasitic insects, wings are reduced to vestigial pads. Several characteristics distinguish insects from other arthropods (Table 2). All members of an insect order share a common maturation process, or metamorphosis. Although entomologists recognize several forms of metamorphosis, when it comes to insect control, only simple versus complex (or complete) metamorphosis is considered. Complete metamorphosis—in which immature and adult stages are very different in appearance and, usually, habitat and food source—often require different measures for comprehensive control of different life stages. Nematocerans (mosquitoes, black flies, sandflies, and midges) (Figure 3). Figure 1. Cyclorrhaphan maggots are usually found in organic matter, whether decaying (filth flies) or living (myiasis-producing flies). Figure 2. Brachyceran larvae are often found along waterways lined with vegetation and mud. Figure 3. Among the Nematocera, immature blackflies (B) are found in rapidly running water; immature mosquitos (M) are found in still waters associated with flooded areas, permanent pools of water, or temporarily filled containers; and immature sandflies (S) are found in crevices or burrows that offer a dark microenvironment with high relative humidity and moderate temperature. 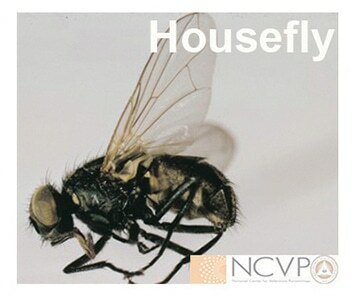 Cyclorrhaphans, including houseflies (Musca domestica), that affect domestic animals are often called “filth flies” because larval and pupal stages are associated with decaying organic material. Some filth flies, such as stable flies (Stomoxys calcitrans), are hematophagous as adults. 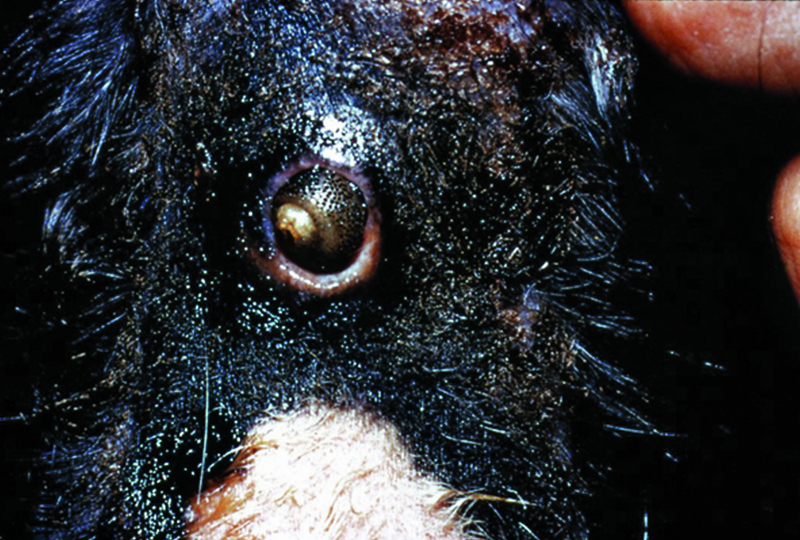 Flesh flies and bottle flies can be associated with facultative myiasis that is often secondary to poor host condition. Some muscoid flies undergo obligate myiasis, which requires a living host for their larval stages. Among these, rodent bots (Cuterebraspecies) are myiasis-producing flies found in U.S. companion animals (Figure 4). Figure 4. A rodent bot (Cuterebra species) in the neck of a cat. Female Cuterebra flies deposit eggs around burrows of their natural hosts (rodents), but the larvae also invade predators that visit these burrows. 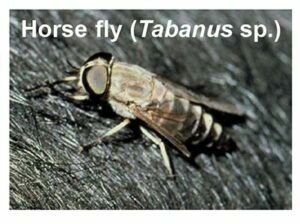 Adult horse flies and deer flies are voracious blood feeders that can serve as mechanical vectors of blood-borne pathogens, such as Francisella tularensis. Brachycera breed near slow-moving water with muddy banks and vegetation. Arboviruses, such as West Nile virus (mosquitoes). Larval and pupal stages require standing water (mosquitoes), rapidly moving water (black flies), or a microenvironment with high humidity (sandflies). Adults can be mechanically controlled with traps, screens, and fans, and chemically controlled with sprays for knockdown and repellants to protect hosts. Ctenocephalides felis (cat flea). 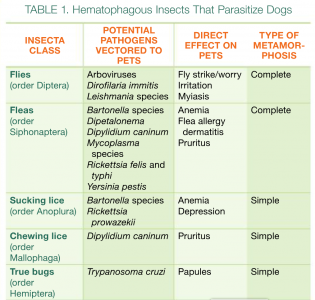 which is the most common ectoparasite of dogs and cats in North America. Cat fleas, however, are uncommon in areas where relative humidity remains below 50% (eg, desert Southwest and Rocky Mountains). 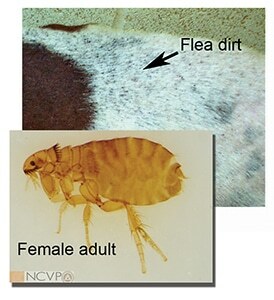 Adult fleas and flea dirt (ie, flea feces) can be removed from the host with a flea comb; flea dirt (Figure 5) is identified when placed on a moist paper towel, which allows the blood-laden feces to dissolve into visible red spots. Figure 5. Laterally flattened Ctenocephalides felis fleas feed and lay eggs that fall off the host, allowing the caterpillar-like larvae and pupae to develop in host bedding and other parts of the environment. 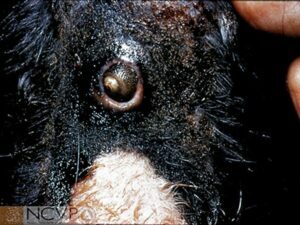 Flea feces (flea dirt) are shown on the pale skin and fur of a heavily infested dog. Flea larvae may occasionally be found on bedding. These tiny, caterpillar-like larvae have poorly developed heads, 13 segments, and sparse setae (insect “hairs”). Fleas undergo complete metamorphosis, making their control particularly challenging,5 and most fleas in an infested environment are eggs, larvae, and pupae. Preventives. Prevention and elimination efforts have changed dramatically over recent decades due to availability of monthly flea preventives.6 Notably, in addition to killing adult fleas, some preventive agents also contain insect growth or development inhibitors that can control immature flea stages. Because infested wildlife or stray companion animals can introduce fleas, the most effective control regimens involve flea preventives from soon after birth (see label claims) throughout the pet’s life. However, there are substantial geographic differences in distribution and seasonality of cat fleas and other flea species; therefore, tailor prevention to the individual pet and client. Environment. Although once critical, multiple environmental treatments at 2-week intervals may not be required if pet owners can tolerate emergence of new adults from flea pupae, which must be attracted to treated pets before they can be killed. Louse nits (eggs glued to hair shafts), nymphs, and adults are all typically found in the same region on the host. Figure 6. The dorsoventrally flattened chewing (Trichodectes canis, A) and sucking (Linognathus, B) lice glue eggs (nits, C) to host hairs, which remain on the host throughout their entire life as they undergo simple metamorphosis. Mallophaga (chewing lice) have large mandibles resulting in wide heads. Trichodectes canis is a chewing louse of dogs and rare vector of Dipylidium caninum. Anoplura (sucking lice) have narrow heads due to piercing—sucking mouthparts; sucking lice also have larger claws adapted for grasping fibers (eg, hair). Linognathus setosus is a sucking louse occasionally found on dogs. Signs of louse infestation are irritation and damage caused by rubbing, scratching, or biting of infested areas. Heavy infestations may cause severe pruritus, restlessness, intense scratching, ruffled or rough matted coat, and sometimes alopecia. 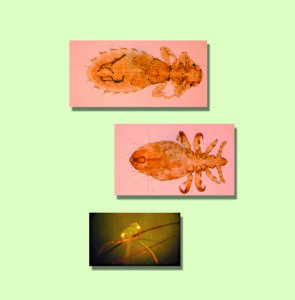 Differentiation of louse head morphology, host species, and sometimes location on the host are often sufficient for identification of lice species. Canine lice are transmitted between dogs through direct contact or by fomites (eg, bedding or brushes) contaminated with hair from infested hosts. Quarantine and treat infested dogs before contact with other dogs, and place treated animals in disinfected living spaces. Because nits are not susceptible to most treatments, they require repeated treatment after 1 week to kill recently hatched nymphs. Nits, nymphs, and adults on fomites eventually desiccate and die. Figure 7. Hemiptera (true bugs), which include Cimex species (bedbugs, A) and Triatoma species (kissing bugs, B), feed on dogs (and human beings). Both possess piercing sucking mouthparts and acquire rapid blood meals from slumbering hosts. The bugs are dorsoventrally flattened, allowing them to reside in cracks and crevices between blood meals. Kissing bugs, which have 2 pairs of wings, and wingless bedbugs undergo simple metamorphosis and are dorsoventrally flattened. They are found in cracks and crevices during the day during all of their life stages. Although a few studies have assessed the efficacy of molecules used in flea and tick preventives, such products have not been sufficiently tested for kissing bug control. 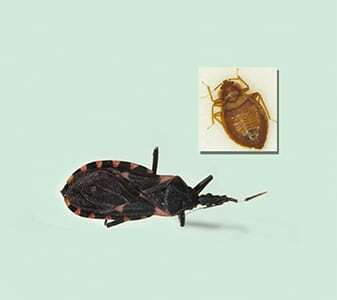 Thus, kissing bug and bedbug control relies on preventing establishment of home infestations and killing the bugs where they hide during the day. The services of a qualified exterminator are recommended. Additional information about parasitic insects, insecticides, and specific products to control these and other parasites can be found through the CAPC resource library.2 Additional, in-depth, and regularly updated parasitic disease control guidelines can also be found on the CAPC website. Read additional Parasite Protocols for Your Practice articles at tvpjournal.com. Figures for this article provided courtesy of the Oklahoma State University National Center for Veterinary Parasitology (ncvetp.org). Foil LD, Hogsette JA. Biology and control of tabanids, stable flies and horn flies. Rev Sci Tech 1994; 13:1125-1158. CAPC Resource Library. Parasite product applications for dogs. Available at: capcvet.org/resource-library/parasite-product-applications-for-dogs. Dryden MW. Flea and tick control in the 21st century: Challenges and opportunities. Vet Dermatol2009; 20:435-440. Blagburn BL, Dryden MW. Biology, treatment, and control of flea and tick infestations. Vet Clin North Am Small Anim Pract 2009; 39:1173-1200. Rust MK, Dryden MW. The biology, ecology, and management of the cat flea. Annu Rev Entomol1997; 42:451-473. Little S, Starkey L. Conquering fleas: Preventing infestations and limiting disease transmission. Today Vet Pract 2012; 2(6):33-39. Arther RG. Mites and lice: Biology and control. Vet Clin North Am Small Anim Pract 2009; 39:1159-1171. Barr SC. Canine Chagas’ disease (American trypanosomiasis) in North America. Vet Clin North Am Small Anim Pract 2009; 39:1055-1064. William Stich, MS, PhD, is a professor of parasitology at University of Missouri, Department of Veterinary Pathobiology. He received his MS and PhD in veterinary parasitology at Oklahoma State University. Dr. Stich served as president for the Conference of Research Workers in Animal Diseases, and as a councilor for the Society of Tropical Veterinary Medicine. He currently serves on the CAPC Board of Directors and as Editor in Chief of Animal Health Research Reviews.